Get out and explore the great museums nearby! There are plenty of Austin museums that are fun and educational for the whole family. Below you’ll find some of our favorites for taking the kids. The name says it all. The whole family is guaranteed to have a blast at this Mueller Austin children’s museum, featuring cool events and hands-on exhibits year round that inspire the imagination of your little thinkers. A great place to take your kid to see live animals, go on a nature trail and investigate science topics. Way better than a textbook. Make sure they check out the Dino Pit, and they’ll likely agree. This historic “living history” museum has all kinds of nature workshops, badge workshops, and camp-outs. Your kids will have a blast in the great outdoors on this farm setting. Perfect for your little dino-lover, this museum on the UT campus features over 500 dinosaur and fossil specimens including the Onion Creek Mosasaur, a 30 foot aquatic reptile that swam in the shallow seas of Texas during the Cretaceous Period. Learn all about Texas history through artifacts, exhibits, IMAX films and more. Take note that there are free family programs on the first Sunday of every month with free admission, too. Kids of all ages have had a blast exploring and playing in the Luci and Ian Family Garden. Go for nature walks, swing in giant swings, look for butterflies and all sorts of native plants. Take a look at all of the cool youth programs the MACC offers for kids to learn about Mexican culture and heritage. This Hyde Park museum looks like a castle from the outside, and the grounds are fun to run around and play. Inside you’ll find many sculptures, but the most fun for kids is climbing up into the tower and looking for the secret door. What kid doesn’t love touching all the pennies in the Cildo Meireles’s Missão/Missões installation or seeing the rainbow colored glass in Ellsworth Kelly’s Austin? The Blanton Museum of Art not only offers impressive art collections, but they also offer families the chance to get hands-on with lots of art activities during the summer months. 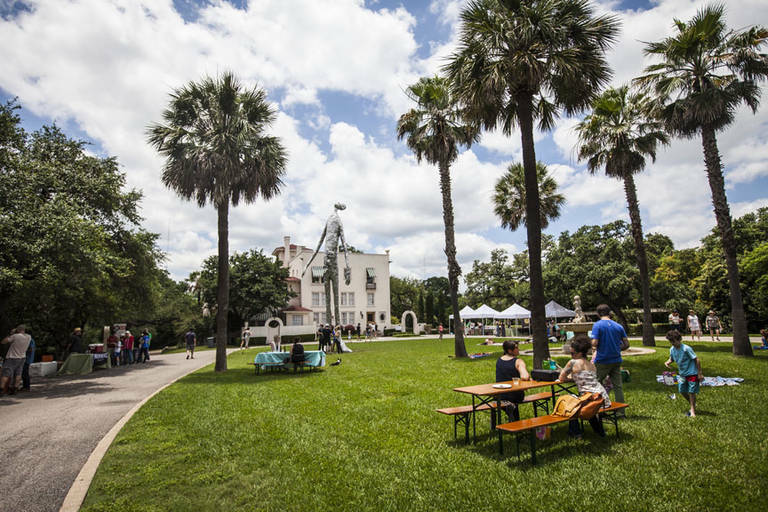 In addition to the art displays and exhibitions, the Contemporary Austin Laguna Gloria hosts a family-friendly art-making workshop every second Saturday of the month. For a list of all area museums, you can check out the Austin Museum Partnership website for lots of information. How about the wonderful Texas Natural History Museum at the University...My children really enjoyed it when they were in elementary school...after all...there are dinosaurs..what more could you want?? ?